Choose G-FORCE™ for all things Line Striping – New Layout, Re-Stripe, ADA Compliance, Stencil Markings, Parking Lot Sign Installation, Warehouse Flooring, Parking Structure Markings, Outdoor Basketball Courts and Athletic Field Markings. We are both Industry Veterans and Military Veterans. 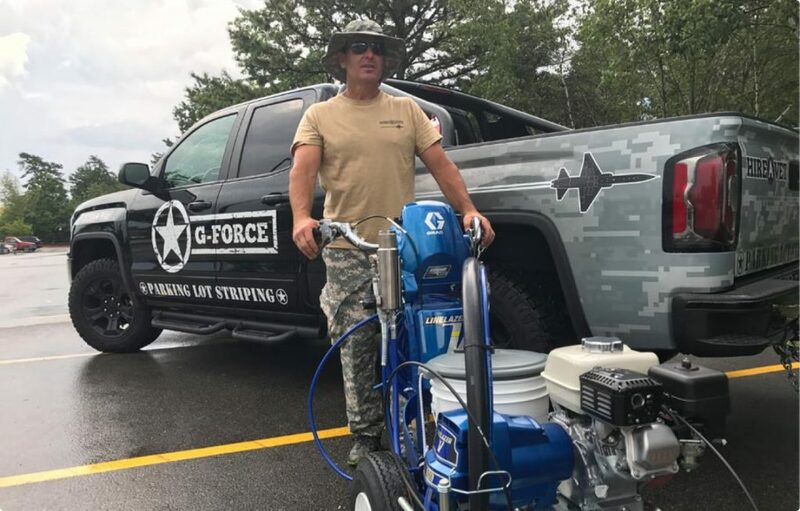 With over seven years’ experience in the Pavement Maintenance and Parking Lot Striping business, coupled with our disciplined military background, you can trust G-FORCE™ to do the job right the first time. Customer-focused – we view our job as that of making your job easier – responsive communications, First Class work product, schedule flexibility, no complicated contracts, simplified change orders, no hassles. G-FORCE™ is on a mission to provide business ownership and employment opportunities for Veterans across the country. Thank you for your interest in G-FORCE™.